See photos of Iain Costall's super buildup here. 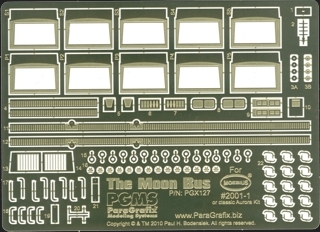 Moebius Models has answered the call and re-released the classic Moon Bus model by Aurora! Replacement pieces for many of the "soft" kit details. Upper constrol consoles for inside the cockpit. Replacement side rails measured directly from the same kit piece used in the original filming miniature. The little know window area grab handles. Replacement handles for the cockpit area - makes filling the nearby seam easier. Drilling guides to make mounting the grab handles easier and more precise. Interior window frames that make masking and painting easier. Piping for the rocket nozzles. Scale-appropriate high gain radio antenna. 2001 Space Pod Lighting Overlays - Working Group"